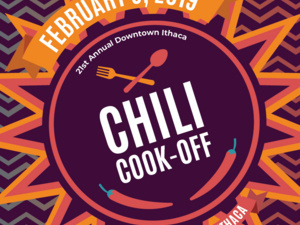 21 years and counting, Chili Cook-Off is one of the biggest, hottest local events in the Finger Lakes region of upstate New York during one of the coldest months! Chili Cook-off features a diverse selection of chili prepared by 40+ restaurants as they compete for the titles of Best Meat/Overall Chili, Best Vegetarian/Vegan Chili, and People’s Choice Chili. In addition to chili, there are other chili-related food items. The Chili Cook-off features a farmers market with vendors and local wineries, breweries, and farmer’s sampling their goods. All activities will take place on the Ithaca Commons and surrounding streets. In addition to chili, check out the annual bear and mustache compeition at the Bernie Milton Pavilion hosted by the Ithaca Beard & Mustache Club. TICKET INFO- Presale tickets are available from Thursday, January 31 through Thursday, February 7 at the Collegetown Bagels locations (203 Aurora St. and 415 College Ave., Ithaca). Tickets will be on sale January 31 through the event at the Downtown Ithaca Visitors Center (171 E. State St.). If you’re coming in from out of town, you can reserve tickets at will-call with your credit card by calling the Downtown Ithaca Alliance at 607-277-8679. As always, you can purchase tickets on the day of the event at the event (cash only.) Tickets are $5 for 5 tastes of wine, beer, and chili, or $10 for 10 tastes. On a tight schedule? VIP tickets give you access to a separate, fast-moving line for tastes, plus an extra prize (while supplies last)! 10 tastes for $20 or 20 tastes for $40.